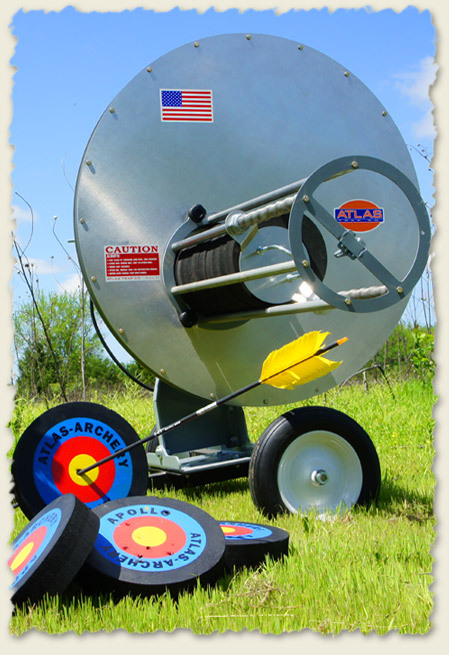 Aerial archery made easy with the Apollo™ archery machine. The Apollo is designed for use by individuals, clubs, hunter’s education programs and anyone who enjoys shooting aerial archery targets. The Apollo was conceived in the spirit of our RTC clay target thrower, the most versatile unit in our product line. Coupled with the input of some of the world’s finest archers, the Apollo’s resulting flexibility is simply unmatched. Quick and easy adjustments for speed and trajectory along the 90°target spectrum allow for an ever-changing practice field perfect for all ages and skill levels. By stepping on a button you can launch targets straight up, along the ground and everything in between. The Apollo is produced with commercial-grade components yet is surprisingly lightweight for portability. Adaptable with our full line of accessories, the Apollo can be tailored to suit the needs of any club or private home. Standard features include a 100’ foot pedal release cord and a five year warranty, with lifetime coverage on the clutch and electronics — the best in the industry.